The largest, boldest, most intelligent and leader-like of Sprats found in the Nautican realm. Zu-Xhi is the only somewhat reliable Sprat that the other Nautican peoples have ever come close to "trusting" (with a very small "t"). Options: Zu-Xhi can take a single enchanted item into battle which can be either Limpet Mix or the Seeds of Maze Weed at a cost of 25pts. Special Rules: Seaborn, "Small Fry", No Safety in Numbers !, A Bigger Fish ! Other Nauticans look down on all sprats (literally), they are seen as being dispensable and almost inconsequential. Nauticans expect "Sprats" to be easily wiped out or flee from combat. Nautican units never suffer panic as a result of the poor performance of "Sprats" on the battlefield. This includes a "Sprat" unit being destroyed, breaking from combat or a unit of "Sprats" fleeing through a friendly Nautican unit. No Safety in Numbers ! (a unit lead by Zu-Xhi cannot join another unit of "Sprats". If Zu-Xhi leaves the unit or is killed then the unit can join others as though it were any other ordinary "Sprat" unit. See respective Coral Hunter / Crest Rider Safety In Number rules). Zu-Xhi is probably the only sprat in history who could be described as organised, in a very disorderly "sprattish" way but organised enough to be able to muster a unit of coral hunters or crest riders and actually get them to obey his orders. Zu-Xhi can lead a unit of up to 20 Coral Hunters or Crest Riders or can operate alone. Units lead by Zu-Xhi can ignore their Anarchic rule while Zu-Xhi lives. A "Sprat" unit lead by Zu-Xhi can switch (reform) between skirmish and normal rank and file formation at will at the beginning of a new Nautican turn*. Reposition the unit into rank or skirmish formation around the most central sprat in the unit. The unit cannot otherwise move in the same movement phase (unless forced to do so) but the unit can fire in the shooting phase and counts as having moved (ie -1 to hit). 1) if Zu-Xhi leads a unit of Crest Riders they must be in rank and file formation before being able to declare a Breaking Wave Charge (see Crest Rider rules). 2) a unit of Crest Riders must start the battle in rank and file formation. 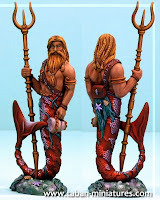 A unit of Coral Hunters can adopt a skirmish formation form the very outset of the battle.